"I used this for my business. It was given to me by someone who thought that CP/M just wasn't going to be around much longer. Can you believe it? At any rate, I was able to maintain my mailing list and write invoices and even print labels on my daisy wheel printer. It still has the Wordstar template on the keyboard." 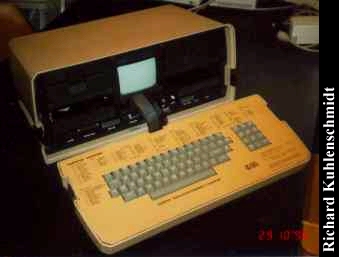 Other quasi-portable computers include the Kaypro II, the IBM 5155 Personal Portable Computer, and the Commodore Executive 64 (SX-64). Click here to view all comments for the Osborne 01 and to leave your own.